Gary Parrish and Matt Norlander look ahead to a stacked weekend of good college hoops, but start at the top with Duke landing Vernon Carey Jr., the No. 2 prospect in the class of 2019. From there, predictions and chatter on undefeated Nevada playing undefeated Arizona State late Friday night (6:49). And on Saturday, Kentucky-Seton Hall (15:20) leads off a loaded day slate. Also going down Louisville-Indiana and Wisconsin-Marquette’s big games (18:20) and the CBS noon tip on Saturday of Michigan State-Florida (20:20). And yes, Buffalo — unbeaten! — gets some shine (23:50). The big game on Sunday is Gonzaga-Tennessee (26:35), but there’s something the guys have to address with Texas (33:15), which has a big game vs. Purdue. Does getting a No. 1 seed matter? On Selection Sunday morning, I wondered aloud why people still get so wrapped up in the question of who gets a No. 1 seed when it’s been six years now since Ken Pomeroy showed that it really doesn’t matter in basketball terms. The first batch of answers to my query muddled the distinction between cause and effect. Yes, No. 1 seeds have a great track record of getting to the Sweet 16 and the Final Four and winning national titles. Top seeds also tend to be the best teams. A far better response I received was that arguing about who should get a No. 1 seed is fun and, besides, receiving a top seed is a really cool honor. No disagreements there. Perhaps we could talk about No. 1 seeds in that vein henceforth, more like an MVP award than as something dispositive to title hopes going forward. It’s a venerable honorific with some nice history behind it, and it provides its own ready-made zero-sum boxing ring for debate. That’s fine. We can do all of the above while also understanding that getting a No. 1 seed makes, in effect, no discernible difference in tournament performance. For example, it is indeed a potentially weighty basketball matter that Duke and Michigan State are in the same region. It makes exactly zero difference, however, what number happens to be printed beside which team. More specifically, getting a top seed has made no significant difference in a team’s chances to reach the Sweet 16 in the KenPom era versus what that same team would have experienced as a No. 2 seed. The data is persuasive, but, before we go there, do we even need the data? Spoiler alert, what about the No. 10 seeds that teams on the No. 2 line get to play on occasion? If we truly think opponent seed is so crucial and that it really does benefit a team on the top line, then we should make a No. 1-seed-level big deal out of a No. 10 seed winning in the round of 64. It should be a big story because that event at one stroke nullifies the whole weak-opponent advantage that top seeds are supposed to receive. The fact that we do no such thing, however, suggests that once games are actually happening we’ve jettisoned our attentive concern for the question of which teams get No. 1 seeds. That is likely a good thing. Indeed, instead of discussing the No. 1 vs. 2 seed question in terms of tendencies and averages, a better way to think of it might be as more like a game show. For instance, a round of 32 opponent will tend to be, on average, very slightly weaker for a top seed than for a No. 2 seed. The key term there, however, is “on average.” It turns out the variance in round of 32 opponent strength for No. 2 seeds is six times as large as what No. 1 seeds see. For the most part, this variance represents the difference between Nos. 7 and 10 seeds. In short, top seeds aren’t distinguished by the fact that they get weak round of 32 opponents as much as they are by the fact that their opponents in the second round are comparatively easy to forecast in terms of their level of strength. That is far less true with any other seed line, including the No. 2 seeds. Do you want the piece of mind that comes from being a top seed and getting a pretty well defined level of opponent strength in the round of 32, or do you want to take a shot at getting a much weaker opponent, possibly even the weakest opponent ever faced by a No. 1 or 2 seed in the round of 32 in the KenPom era, No. 10 seed Alabama in 2006 (+11.05)? By saying yes to a No. 2 seed, you’re taking a one-in-three chance that your opponent in the round of 32 will actually be weaker than the average opponent for a No. 1 seed. Moreover, the difference in opponent strength in the round of 32 for top seeds vs. No. 2 seeds shown above is, as you would expect, overwhelmed numerically by the gulf in the quality of the teams on the top two lines themselves. In basketball terms, what matters is how good you are and how good your opponent is. The question of whether the NCAA hands you a No. 1 or a No. 2 seed doesn’t change the first answer at all and has, as we’ve seen, a relationship to the second answer in the round of 32 that varies between weak and outright paradoxical. What if we had eight regions instead of four? Would we ponder how the committee drew the line between the Nos. 8 and 9 teams? What if teams were numbered from 1 to 68? Same teams, same bracket, same rims, ball, court, etc. What would that seeding debate look like? When I was being forced to learn about semiotics at length and repeatedly in grad school, I remember thinking it was rather a waste of time. The robust annual discussions of No. 1 seeds as something that really can make or break a team’s tournament chances, however, prove that I owe semiotics a big apology. The signifier “1” next to a team’s name exerts a completely non-sports pull on the deepest and most fundamental portion of our brains that no amount of basketball information will ever dispel. So be it. MVP awards are a cool honor and fun to debate. It’s the final day of simultaneous action for this year’s edition of March Madness. The lowest-seeded team is a 5, the Auburn Tigers. Historical data from College Basketball Reference’s Matchup Finder. Graphic by Chris Dobbertean using logos from SportsLogos.net. No. 3 LSU Tigers (28-6, SEC at-large) vs.
With a win, LSU will reach its first regional final since 2006, which led to the Tigers’ fourth Final Four trip. Amazingly, Michigan State last got past this round in 2015, when the Spartans also reached their last Final Four. No. 5 Auburn Tigers (28-9, SEC automatic bid) vs. Surprisingly, Auburn and UNC haven’t met all that frequently, with the Tar Heels recording a 62-56 win over the Tigers in their own backyard in the 1985 Southeast regional semifinals in Birmingham. 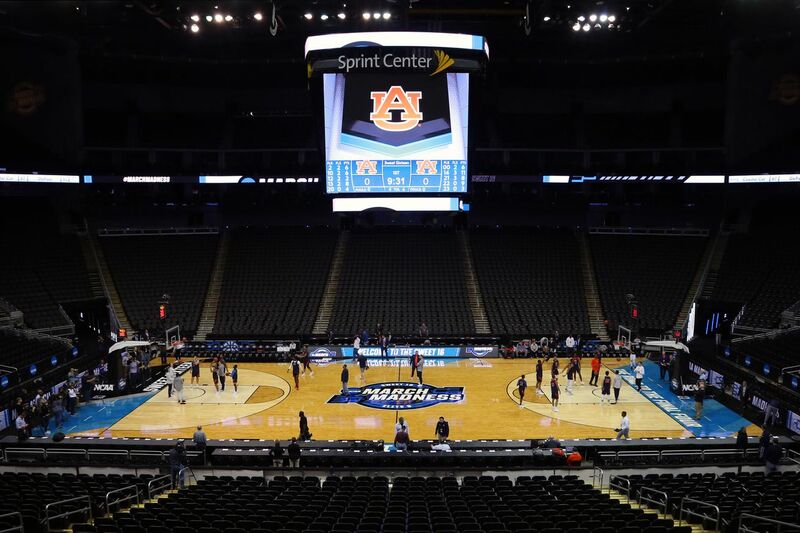 Auburn’s NCAA history is spotty, as this will be their fifth Sweet Sixteen appearance, the first of which was that game against Carolina, but they’ve only won once at this stage, in 1986. On the other hand, UNC has reached this stage six times in this decade alone, with four of those trips turning into Elite Eight bids. The last of those came in 2017, when Roy Williams’ squad ended up cutting down the nets in Glendale, Arizona. No. 4 Virginia Tech Hokies (26-8, ACC at-large) vs. This is our lone intraconference matchup of the Sweet Sixteen round, with the Hokies having defeated the Blue Devils in each of the last three seasons. Of course, all of those wins came at home, though you’d suspect that Tech will have decent fan support in Washington, D.C. February 26th’s Hokie victory came with Zion Williamson out for Duke and Justin Robinson absent for Virginia Tech. Both will be back tonight, while Ty Outlaw will play despite being charged with marijuana possession, as he passed a drug test. No. 3 Houston Cougars (33-3, American at-large) vs. Okay, the loser of this game needs to be forced to change their logo, since both look like they came from the same template. On the court, Houston is aiming to reach its first Elite Eight in 35 years, while Kentucky last won in this round two seasons ago. Again, the Cougars have a long Final Four drought, while Kentucky has four trips in this decade alone and eight since the two played in separate national semifinals in Albuquerque in 1984. (UK did defeat Houston that January, 74-67 in Lexington.) The pair also met in a home-and-home series in the 2006-07 and 2007-08 seasons, with each winning in their own building. Enjoy this post? Follow Blogging the Bracket on Twitter and Like the site on Facebook. Tennessee upset Gonzaga 76-73 on Sunday afternoon. Incredible game. Parrish and Norlander open on that and touch on a whole bunch with both teams, then get to Kentucky (16:09) dropping out of Parrish’s Top 25 and 1 rankings. The new No. 1? Kansas (27:44). It had to rally this weekend to beat New Mexico State 63-60 in Kansas City. Elsewhere, there were a couple of good one-point games this weekend between currently unranked, but still big-time, basketball programs. Indiana beat Louisville 68-67 (37:32) and Syracuse beat Georgetown 72-71. The guys close on Villanova (42:51) and Bill Walton’s polarizing nature as a color commentator (45:58). Gary Parrish and Matt Norlander open this episode by discussing Villanova’s worst nonconference performance since 2013, with a focus on the drama surrounding freshman point guard Jahvon Quinerly. From there, the guys discuss Norlander’s report about the Big East having been approach by multiple schools about expansion (20:02) and Mark Few’s reiterated criticism of NCAA president Mark Emmert (29:03). Tonight’s Sweet Sixteen action features seven teams from the top four seed lines and an interloper, the 12th-seeded Oregon Ducks. No. 4 Florida State Seminoles (29-7, ACC at-large) vs.
Gonzaga will be looking for revenge against the FSU team that eliminated them from last season’s NCAAs at this stage, one county north in Los Angeles. Again, the Bulldogs are the higher seed and will be favored, though the Seminoles aren’t the plucky No. 9 seed that eliminated Xavier in 2018’s second round. With a victory, Leonard Hamilton’s team will be in its second straight Elite Eight — one win a way from a first Final Four appearance since 1972. As for Mark Few’s Zags, they last reached a regional final and Final Four in 2017. No. 3 Purdue Boilermakers (25-9, 16-4 Big Ten at-large) vs.
Purdue and Tennessee have met sporadically over the years, with the last meeting taking place in November 2017, when the Volunteers edged the Boilermakers 78-75 in the Battle 4 Atlantis quarterfinals. Remember that Purdue routed tournament favorite Arizona on the final day of that event, in the seventh-place game! While Matt Painter’s squad has now reached the Sweet Sixteen in three consecutive years, the Boilermakers have lost four straight times in this round. Their last Elite Eight appearance came in 2000. As for the Volunteers, their last trip to a regional final was just nine seasons ago, in 2010. Tennessee has never reached the Final Four, while Purdue last made it to the season’s ultimate weekend in 1980. Curiously, both of these teams and Florida State will feature in November’s Emerald Coast Classic in the Florida Panhandle. No. 3 Texas Tech Red Raiders (28-6, Big 12 at-large) vs.
Michigan and Texas Tech meet for the first time since December 28, 1983, though the Wolverines will undoubtedly have a sense of deja vu considering they eliminated another Texas team, Texas A&M Aggies, in this round last year, also in Southern California. I don’t think Michigan will hit quite as many threes as they did in that contest, however. Tonight’s winner will reach a second consecutive Elite Eight. In Michigan’s case, they’re looking for a fourth berth since 2013. Last season’s regional final appearance was Tech’s first ever. No. 12 Oregon Ducks (25-12, Pac-12 automatic bid) vs.
Virginia is looking to return to the Elite Eight for the first time since 2016, though the Cavaliers’ Final Four drought famously extends to 1984. Oregon, meanwhile, last reached both a regional final and national semifinal just two seasons ago. Quade Green has transferred out of Kentucky. Are the Wildcats losing a bit of their grip — or is Calipari losing his touch? Parrish and Norlander start there, then give Crossroads Classic preview (14:24), as Notre Dame-Purdue and Butler-Indiana play on Saturday on CBS. There are loads of good games this weekend, including UNC-Gonzaga (19:00) and Nova-Kansas (24:05). Plus, Norlander tips you on teams on upset watch (29:33), in addition to a brief Sunday preview of games (39:15). 12/16: Kansas is No. 1 but doesn't look like it; Gonzaga's hopes for a 1 seed aren't lost; will Big Blue Nation forgive Rick Pitino? Kansas is 9-0 and ranked No. 1. But the Jayhawks haven’t looked so great much of the season. Is this team overrated? Norlander and GP open on that, then get to Gonzaga (7:45), which lost its second straight on Saturday. Elsewhere, Indiana (18:06) provided the best ending of the weekend. Not good: the Pac-12 (23:27), which is now neck-and-neck with the American Athletic Conference in competing with the worst of the seven biggest leagues in college hoops. And if you missed it, Kentucky (34:02) honored its 1993 Final Four team, coached by Rick Pitino, on Saturday at Rupp Arena. But Pitino was not in attendance, despite John Calipari inviting him. Oats went 93-43 in his four-year tenure at Buffalo. Buffalo head coach Nate Oats will be the next head coach at Alabama, Alabama AD Greg Byrne announced on Twitter Wednesday afternoon. 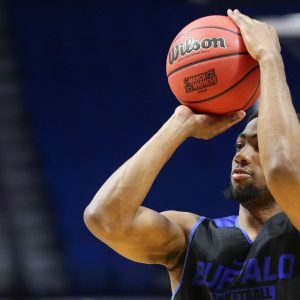 The news comes a mere 13 days after Oats and Buffalo signed a four-year extension that would pay him $837,000 per year, plus $225,000 of extra funding for the basketball program. Once former Alabama head coach Avery Johnson and requested a buyout, the program and Johnson mutually agreed to part ways, officially opening up the Crimson Tide job on March 24. Oats amassed a 93-43 record during his four-year tenure at Buffalo, in which he led the Bulls to three NCAA Tournament appearances in four seasons. 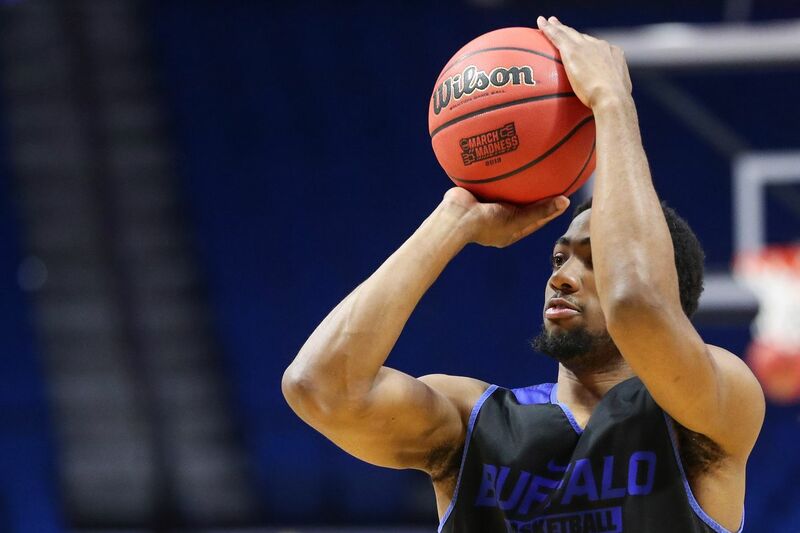 Under his direction this season, Buffalo boasted five all-conference selections, including the MAC Player of the Year in CJ Massinburg. Oats, a two-time MAC Coach of the Year recipient, led the Bulls to a 32-4 record and an NCAA Tournament appearance this season. 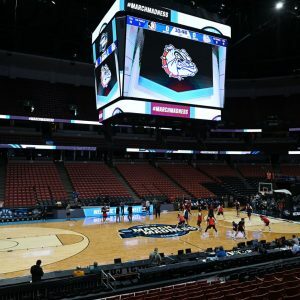 The Bulls bowed out of the Big Dance with a 20-point loss to Texas Tech in the Round of 32 after shellacking 11-seed Arizona State in the first round. 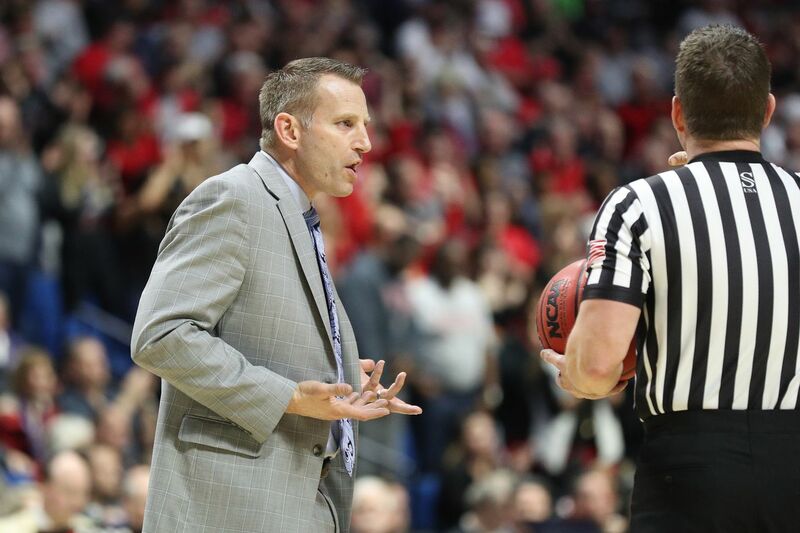 Tuesday got the college hoops coaching carousel whizzing, so before Gary Parrish and Matt Norlander resume their NCAA tourney convo, they open by talking the biggest jobs that are available and the ones that have closed or will close in the coming days. They touch on Nebraska, BYU, Arkansas, Iowa State, UCLA, Alabama and more. Then it’s onto the predictions and previews for every regional semifinal, starting with the games in the West (24:30), then the South (33:30), the East (41:00) and the Midwest (47:00). As we head into the two most important days of the season for the bubble, it’s worth having a little discussion about the final few spots. For the time being, there are really only four spots up for grabs, but that can change for multiple reasons. Teams on the bubble can win or lose, of course, but we can also have bid stealers, either because a team steals an auto-bid in a major conference, or because a team like Kansas State or Illinois goes on a run in their conference tournament. And that brings me to Illinois State, which is clinging onto the last projected spot right now. In the end, I expect Illinois State to end up (unfortunately) missing the NCAA Tournament. The power of the RPI is too strong. I just don’t know at this point which team is going to jump up and grab that spot. But the odds are that somebody will. There is a push for Syracuse to earn an at-large bid due to 6 RPI Top 50 wins, but even that RPI metric can’t save them, I don’t think. There’s a bit of a fluke that, for example, their win over Monmouth counts as an RPI Top 50 win (for now). They are just 8-9 vs the RPI Top 100 and 12-13 vs the RPI Top 200, which really would be unprecedented. And, of course, an RPI of 84 would be unprecedented as well. 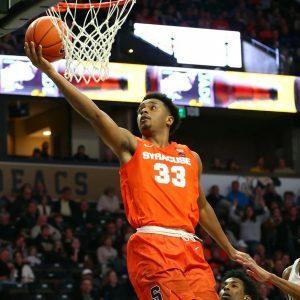 Outside of RPI Top 50 wins, what other metric even suggests that Syracuse should be in the conversation? With Syracuse dropping out of the bracket, Rhode Island slips back in. Meanwhile, we had three changes in auto bids due to tournament upsets. Northern Kentucky won the Horizon (replacing Green Bay), Iona won the MAAC (replacing Monmouth), and South Dakota State won the Summit (replacing South Dakota). 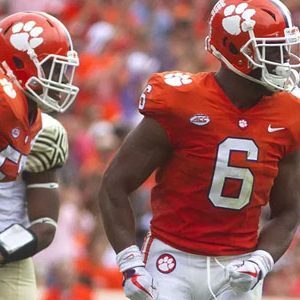 Just three teams were eliminated from at-large contention since Sunday: Clemson, Georgia Tech, and Ohio State. That leaves 17 teams not in the projected bracket that still have a chance for an at-large bid, but expect at least half a dozen of those to be eliminated over the next three days. A chalky run of results in the first two rounds of the NCAAs have Parrish and Norlander recapping and reflecting on the best, and most overlooked, moments of the first weekend. The guys start with their thoughts on the first two rounds, then move along region by region. They start with the East (11:00), which of course leads on Duke’s escape from UCF. From there, it’s to the West (22:00), then the South (32:00) and they close with the Midwest (42:00). There are a couple of noteworthy things going on in college basketball in March of 2019 that do not involve Michael Avenatti. First, we’ve suspected for weeks now that there’s an unusually dense concentration of big swaggering capital-letter Great Team behemoths roaming our hoops landscape in 2018-19. 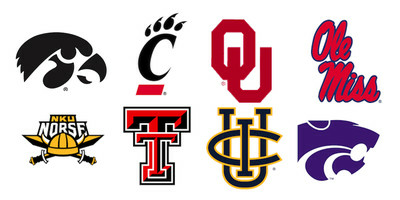 Pick your flavor and choose your boundary line, but, speaking generally, this field’s top 10 or 11 teams together constitute an oligopoly of hoops hegemony the likes of which we don’t often get within the confines of a single season. 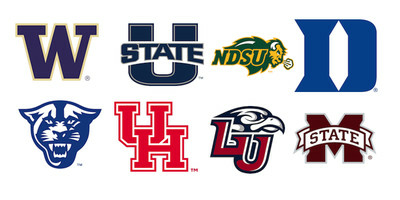 Second, all of those teams, every one of them, won two games during the first weekend of the 2019 NCAA tournament. Not to be outdone, so, too, did the tier of teams right below the big guns. When you put chalk together with behemoths, you get a Sweet 16 that fairly blows its predecessors out of the statistical water. While we’re here, don’t hate on 2018 for having the weakest Sweet 16 of the bunch. The Final Four still turned out pretty well, and, anyway, a No. 16 seed winning in the round of 64 was a pretty big deal with considerable statistical consequences downstream. Back to 2019. What, precisely, is the cash spectating value of having such a strong field? Excellent question. One might venture to say it means we must be in for a Thursday and Friday of great viewing, for example, but experience tells us that’s not necessarily a sure thing. North Carolina and Gonzaga were both statistically blessed in 2017, after all, and the result was actually a rather unsightly title game. Conversely, Butler in 2010 was no one’s idea of a KenPom idol, but good luck prying that title game out of my all-time-best vault. Basically, everyone’s particular taste is going to be sovereign in such matters, so I’ll go first with mine. To me, the best thing about having the strongest Sweet 16 ever (where “ever” starts at noon on November 1, 2001, sorry, old geezers) is simply that it increases the probability that we could get a Final Four worthy to place alongside the ones we had in 2008 and 2015. 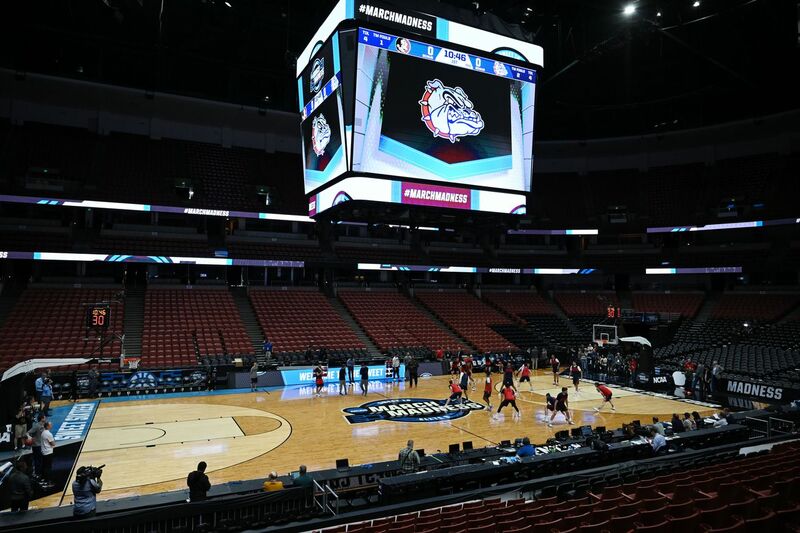 There’s no one prescribed manner in which to have a great Final Four, and certainly the sport’s final weekend is a blank canvas of opportunity with a dizzying array of textures and moments. 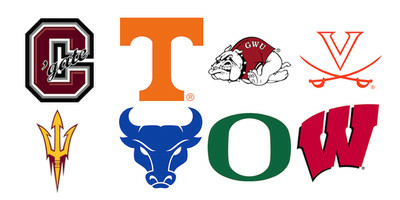 That said, one way a Final Four can be really good is if it has a lot of really good teams. The 2015 Final Four was amazing in that respect. 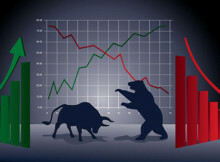 Some years we know in advance that a 2015 redux isn’t in the cards, but it’s very much still in play for 2019. Assuming chalk continues for one more round, there may be some fixating on whether all four No. 1 seeds can get to Minneapolis. That’s intrinsically interesting, surely, but, if it comes to that, do keep in mind we can have one extreme outlier of a gathering even if one or two non-No. 1 seeds reach the Final Four. The one piece of coach-speak that is absolutely true and indeed ahead of the curve is that a seed is just a number next to a team’s name. Preach, coaches: Michigan and, especially, Michigan State are No. 1 seed-quality teams lurking in the bracket with “2”s next to their names. Regardless of those numbers, it will be great if four great teams make it to the Twin Cities. It could happen. Down to the final 36 hours of Championship Week, the bubble is coming very clearly into view. At this point, realistically, there are 7 teams fighting for 5 spots. For now I have slid Kansas State into the bracket and Illinois State out, but I wouldn’t totally count Illinois State out yet. 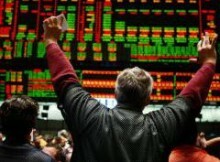 The real concern for them is further bid stealing, with the Atlantic Ten looming as a possibility there. With a number of 1 seeds going down in their conference tournaments, the 1 seed line is opening up. I feel increasingly confident that Kentucky will earn a 1 seed if they win the SEC tournament, sliding 7-loss North Carolina down to the 2 seed line. Oregon will get some 1 seed hype if they win the Pac-12 tournament, though in my opinion the Pac-12 resumes across the board are being overrated by the media. To me, Gonzaga really should stay on the 1 line. Five more teams were eliminated from at-large contention since Wednesday: Boise State, Colorado, Mississippi, Tennessee, and Utah. That leaves 12 teams not in the projected bracket that still have a chance for an at-large bid. With 31 games in six days, the NAIA brings wave after wave of do-or-die action before crowning a champion. KANSAS CITY, Mo. — Uncertainty hangs over Frank Cordaro’s annual Springtime trip to Kansas City. For the last five years, he and his family have made the nine-and-a-half hour drive from Northern Louisiana, unsure exactly when they’ll return. Luckily, hotels have tended to understand. Cordaro’s son, Larry, is the head men’s basketball coach at Louisiana State of Alexandria, an NAIA program that Larry built from scratch. Cordaro (the younger) was named the school’s first head coach in 2014. In that short time, Cordaro has built a power, literally, out of thin air at this school with an enrollment of only a little over 3,000 students. The Generals have made the 32-team NAIA Division I Championship Tournament in each of their five seasons. 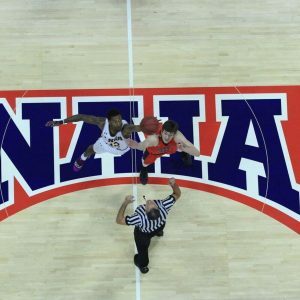 Unlike the NCAA’s three-week March affair, the NAIA’s entire tournament is played over six days at Kansas City’s Municipal Auditorium, with all 32 teams shuffling in and out of the historic arena in a blaze of games. LSUA’s instant success has created an annual Midwestern pilgrimage with those fluid travel plans for Frank Cordaro. The hotel rooms, however, have stayed booked as scheduled more often than not. The Generals have twice made the NAIA’s “Fab Four,” playing until the last day of the 2018 tournament as they fell in overtime to Graceland (Iowa) in the championship. They came to Kansas City as one of the four No. 1 seeds this season, with the No. 2-ranking in the country attached to their name. Led by hefty 6’11 senior center William Claiborne, the Generals kicked off their title challenge by beating Central Baptist (Ark.) on March 21. Larry Cordaro has created a power in just five years at LSUA. That was one of eight games — with 10 minutes in between — that Wednesday, which began at 9 a.m. local time and lasted late into the night, with the final game carrying a 10 p.m. scheduled tip. The Generals got a favorable draw, with their second round game not until Friday. That would end up being a tight win over Bethel (Tenn.), but the Generals didn’t get that same opportunity for recovery ahead of their next game in the quarterfinals. Carroll College (Montana) was not so fortunate from the jump. The third-seeded Saints — making their 13th overall championship tournament appearance — opened with a first win over St. Thomas (Texas) on Thursday. Less than 19 hours later, they drew the bright-and-early 9 a.m. second-round tip. As Starbucks cups and blank stares staggered to work in downtown Kansas City last Friday morning, the concession stands were open and T.I.’s “Bring Em Out” was flowing out of Municipal Auditorium’s sound system. 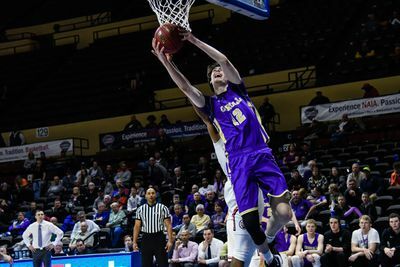 It was basketball as usual, and Carroll senior forward Match Burnham exploded for 34 points and 11 rebounds, as the Saints stymied Oklahoma City University late with a zone to move on to the quarterfinals. “We just stayed up, it’s so early. We thought Oklahoma City would go to bed, so we were up longer than them and had a good start,” joked Saints first-year coach Kurt Paulson after the game. As he got serious, he mentioned that the quick turnaround and frenzied format was more mental than anything else. As he stood there in one of Municipal Auditorium’s Art Deco hallways, he thought about returning the next day to take on Pikeville (Ky.) in the next round. Calories, rest and letting the adrenaline wear off were on the schedule for the rest of the day, and whatever the plan ending up being, it worked. The Saints bolted past the Bears on Saturday to reach the semifinals, their second-ever appearance in the Fab Four. A compressed schedule within a compressed schedule is part of the challenge of navigating that far. On top of needing to win three games in three days, Carroll — like all teams — had to do so well outside of its usual pregame routine. With only 10 minutes between games, teams usually congregate near the tunnels as the first half of the preceding game wraps up, and take the floor during halftime to get shots up. That limited floor time is something Paulson had been getting his team ready to deal with. Match Burnham has propelled Carroll into the final. “We do it out in the hallway, right here,” he added, gesturing to the hallway he was standing in. The mad dash of games is not just felt by players and coaches. By the end of last weekend, plenty of basketball had passed before Steven Davis’s eyes. The veteran announcer is the play-by-by voice of UMKC basketball and the Arkansas Travelers, the Seattle Mariners’ Double A affiliate. For 15 games spread across last Wednesday, Thursday and Friday, and then two more on Saturday, he was also the voice of the NAIA Network, calling games on the association’s webcast. Armed with his beverage of choice — straight water — he said there’s only so much you can do to prepare for the rapid fire schedule with no breaks to regroup. But to Davis, that’s what it makes it fun. His Thursday smorgasbord of games did, in Davis’s words, start to “push it,” entering the fourth game. But with first-seeded Benedictine College (Kan.), located just over an hour away in Atchison, Kan. taking part, the arena filled with the energy of a few thousand fans. Any slight dip immediately vanished. “It’s real easy to be up and into a game like that, and the game right after went right down to the wire, so it didn’t matter that it was past midnight before it got done,” he said. Leaving Municipal Auditorium at 1:06 am. Great games up and down today. Fantastic atmosphere for the 2 OT game involving @ravenathletics. 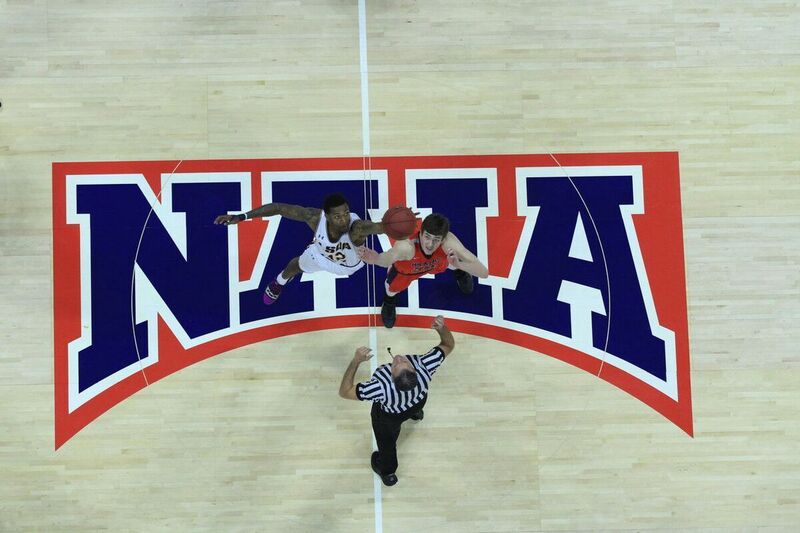 The wave after wave of basketball will lessen a bit in the coming years, as the NAIA revamps its format. The organization is set to merge its Division I (94 members) and Division II (138) ranks together, and create a 64-team tournament beginning in 2021. 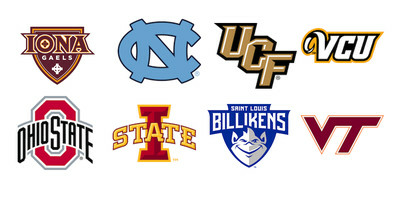 The opening rounds will be settled in 16 four-team regionals, with the 16 winners advancing to Kansas City. Municipal Auditorium, which has hosted the event for 55 out of its 73 years, will continue to be the crowning ground for the NAIA championship. 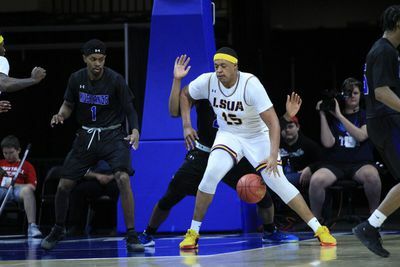 For its part, LSUA wound up falling to Lewis-Clark State College (Idaho) in the quarterfinals, unable to return to the championship game. But given the Red River Athletic juggernaut his son has built in Alexandria, Frank Cordaro may well make those 2020 reservations already. One of his favorite parts of the now-annual trip? 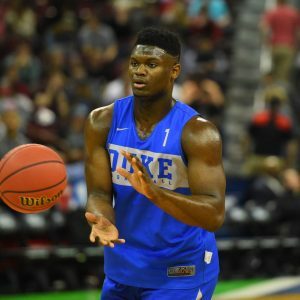 That number may soon be cut in half, but the charm and intensity of one of the nation’s most unique college basketball events should stay the same. Georgetown (Ky.) will play Carroll (Mont.) at 8 p.m. CT on Tuesday night in the championship. The most controversial pick in my bracket is going to be UT-Arlington in over Kansas State. I’ve detailed just why Syracuse should not be in this bracket, but I think that UT-Arlington will be rewarded for a very difficult non-conference strength of schedule. Illinois State is the “mid-major resume” that many are focusing on, but the fact is that UT-Arlington played a significantly tougher non-conference schedule and has the better premier win (at Saint Mary’s). The bad losses, historically, just don’t matter much. There’s a history of the Selection Committee making a statement about non-conference strength of schedules, and if they do this season then they’ll reward UT-Arlington (non-conference RPI SOS of 38) and punish Kansas State (non-conference RPI SOS of 228). Other than the bubble, the public discussion always focuses on the 1 seeds. To me, it’s between Kentucky and Duke. I understand that North Carolina won the ACC regular season title while Duke was 5th, but the fact is that the ACC schedule is very unbalanced (and North Carolina had a much softer schedule than Duke). Duke/Kentucky is a 50/50 pick, and I went with the better wins and better league with Duke. If it’s Kentucky, I won’t complain. This is the Region Of Death: It’s become an annual tradition that the overall #1 seed earns the Region of Death. I’m not exactly sure what the point of the overall #1 seed designation is if you’re going to give them arguably the Big Ten’s best team as your 8 seed, two Top 10 Pomeroy teams in the 4/5 game, and the most talented roster in the nation as your 2 seed. Villanova might be the best team in the country, but it’s awfully hard to pick them through to the Final Four simply because their schedule is so brutal compared to what a team like North Carolina gets to see. Don’t fall for the 12/13 seed hype: UNC-Wilmington and East Tennessee State are both popular upset picks, but the fact is that neither is higher than 60th in Pomeroy, and both struggled against major conference opposition this season. With two truly elite teams in Virginia and Florida there, I’d recommend taking chalk. SMU is a tough team to figure out: They’ve gotten into a groove in conference play, but just how good was the AAC this season, exactly? Is it possible that part of SMU’s dominance was simply due to the lack of top end athleticism in the league (aside from Cincinnati)? The fact that they only basically play six players is a concern against an opponent as physical and big as Baylor that is going to grind on them and wear them out. As good as SMU’s computer numbers are, the personnel edge has to go to Baylor there. Run away from South Carolina: Always stay away from the wildly over-seeded team, and no team was more over-seeded in this year’s bracket than South Carolina. They are 3-7 vs Pomeroy Tier A/B opponents since January 20th, with their top winning in that stretch coming at Mississippi State. They defend well, but their offense is ugly, as they shot just 33.4% on three-pointers and were dead last in the SEC in 2P% in conference play. Unless they utterly dominate the glass, they’re going to lose to Marquette. Go with the most talented roster: And that is Duke. 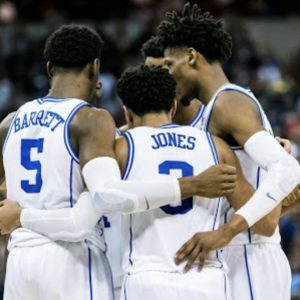 Now that Jayson Tatum and Harry Giles, in particular, are healthy and playing well, Duke has the most talented roster in the nation. They have played as well as any team over the last month and a half. And even if you think that Villanova is a slightly stronger team than Duke, the fact is that Duke has a significantly easier path to the Elite 8, with Baylor being the only team that is really going to scare them. So unless you think Villanova is the significantly better team, you should take Duke to the Final Four. North Carolina was handed a gift draw: This seems to happen every year, but the overall #1 seed earns the Region of Death while the least deserving 1 seed earns the Region of Life. Obviously Kentucky is a tough potential Elite 8 match-up, but North Carolina has as easy of a path to the Elite 8 as any team could ask for. The media will tell you that the South is the toughest region because it has three huge #brand names as 1-3 seeds, but that’s not the proper way to judge a region. How do you deal with Wichita State? : I honestly don’t know the answer to this one. Wichita State is obviously a ridiculously strong 10 seed, as they are 8th in Pomeroy, but the fact is that part of that is due to dominating athletically inferior opponents. They were 0-4 against Pomeroy Tier A opponents, and only one of the four games was particularly close. This Kentucky team is as good as any in the country, and so they have to be favored in that second round game. The real shame here is that the Selection Committee forced those two teams to play so early. It’s not just North Carolina with a soft draw: Butler got an easy draw, too. Winthrop is a much softer opponent than Middle Tennessee, and even if Minnesota gets through they were probably the weakest 5 seed in any region even before the Akeem Springs injury. Butler will probably run into a brick wall when they play North Carolina, but I would feel pretty good taking them to the Sweet 16. Stay away from UCLA: One of my annual recommendations is to stay away from teams depending on outside shooting and which are weak defensively. Teams like that look great when the shots are going in, but it just takes one day of cold shooting for it all to go up in smoke in a one-and-done tournament. For all the hype, UCLA is just 18th in the Pomeroy ratings. The only two defenses they’ve seen all season long as strong as Cincinnati have been Kentucky and Michigan, and UCLA happened to shoot the lights out in both of those games (53% total on three-pointers). Cincinnati has a strong perimeter defense and will test UCLA in the paint. Despite mounting a huge second-half comeback, Oregon’s athleticism and shooting was too much to handle. 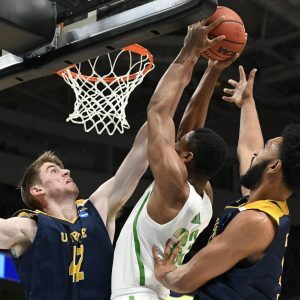 Despite double-figure outings from Robert Cartwright, Evan Leonard and Tommy Rutherford in a furious second-half comeback, the 13-seed UC Irvine Anteaters were shut out of their first-ever Sweet Sixteen appearance in a 73-54 loss to Oregon on Sunday night. UC Irvine fell behind early and had to play catch-up — something the 31-win team rarely had to do this season. An early five-minute drought led to a 10-0 Oregon run that put the slow-paced Anteaters behind the 8-ball for the majority of the game. Whenever the Anteaters needed a spark, they got it from Evan Leonard or Tommy Rutherford — the latter of whom scored 10 points after being shut out of UC Irvine’s second-round win over Kansas State. Unfortunately for the Anteaters, the shooting and defense from former Nevada commit Ehab Amin was too much to handle. The onetime Texas A&M-Corpus Christi star came off the bench, grabbed several key offensive rebounds against UC Irvine’s bigs and hit several threes to help the Ducks fend off the Anteaters in the first half. 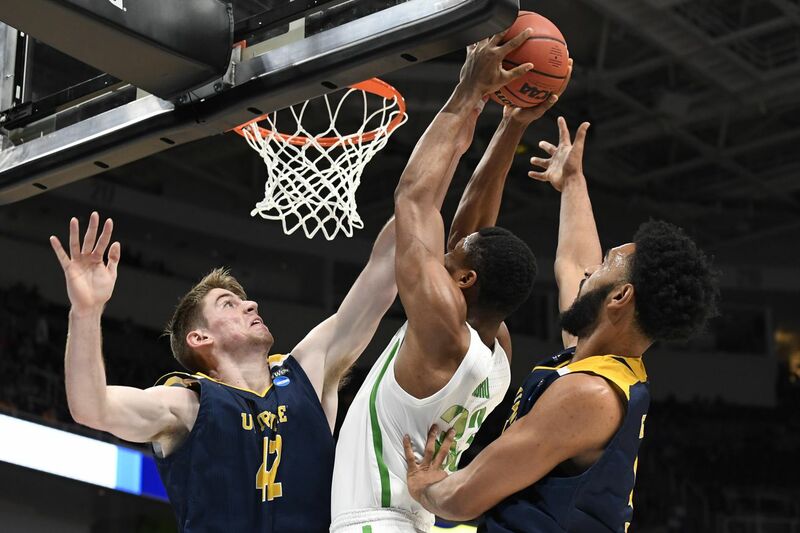 Couple his play with Oregon’s pressure defense, which baited UCI into eight first-half turnovers and 9-27 first half shooting, and the clock struck midnight on the tournament’s lowest-remaining seed before the halftime. If there was a lone bright spot for the Anteaters on both ends of the floor, it was senior big man Jonathan Galloway. The three-time Big West Defensive Player of the Year more than held his own against a Power-5 frontcourt. He led the way with five points, seven rebounds and one thundering block in the first half, but was shut down in the second half. In his last game as an Anteater, Galloway finished a point shy of a double-double with 9 points and 11 rebounds. But the Anteaters, who had a nation-leading 9-3 record while trailing at halftime, battled back. The Anteaters scored six points in under three minutes to pull within four points. Although both teams looked like they were actively trying to lose — those three turnovers in 18 seconds on bad inbounds passes come to mind — the Anteaters stormed back to tie it with a 14-0 run. Meanwhile, Oregon didn’t score until — who else — Amin hit a three at the 12:28 mark. He drew a questionable offensive foul call on the very next play, and the Ducks were off and running again. Crucial turnovers tanked UC Irvine’s momentum; Oregon’s Peyton Pritchard and Kenny Wooten took advantage of it. Pritchard scored 10 of his game-high 18 points in the second half, while Wooten’s near-triple-double of 11 points, eight rebounds and seven blocks was the difference-maker. After tying the game at 35-all, UC Irvine was outscored 38-19 to close the game. UC Irvine’s season comes to a close at a program-best 31-6 record and its first-ever NCAA Tournament win. With six of its 10-man rotation set to return next season, head coach Russell Turner will have plenty of incentives to spurn bigger offers at PAC-12 jobs to stay in Irvine. Today’s games have to be more entertaining than the majority of Saturday’s were … right? No. 10 Iowa Hawkeyes (23-11, Big Ten at-large) vs. The Hawkeyes and Vols last met in 2014’s First Four, with Tennessee outscoring Iowa 14-1 in overtime to advance to the main draw — a run that ended with a 73-71 loss to another Big Ten opponent, Michigan, in the Sweet Sixteen. That was UT’s last trip to the second weekend, Iowa last qualified for regionals 20 years ago. No. 9 Washington Huskies (27-8, Pac-12 at-large) vs.
Back in 2011, UNC and Washington met in a 2-vs.-7 matchup in the Tar Heels’ backyard of Charlotte, resulting in an 86-83 Tar Heel win. This time around, Carolina won’t quite have such a home-court advantage. The Huskies can reach their first Sweet Sixteen since 2010 with a victory, while the Heels can get back for the fourth time in five seasons. No. 9 UCF Knights (24-8, American at-large) vs.
On Friday, UCF picked up its first-ever Division I NCAA Tournament win, while Duke has many, many, many more. Today’s matchup will be the pair’s first meeting on the hardwood. No. 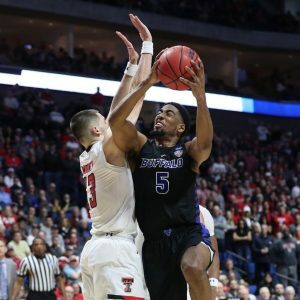 6 Buffalo Bulls (32-3, MAC automatic bid) vs.
Texas Tech, an Elite Eight team one season ago, faces a considerable hurdle this evening in its quest to reach the West regional, a Buffalo team ranked just five spots lower in the NET. That’s the second smallest gap among all 16 Second Round matchups. Like Duke and UCF, the Bulls and Red Raiders are playing for the first time ever this evening. No. 12 Liberty Flames (29-6, ASUN automatic bid) vs.
Two schools less than two hours apart meet clear on the other side of the country for a spot in an East regional that will be played in a far more convenient location — Washington, D.C. Naturally, these two Virginia rivals have played several times, meeting every season between 1992 and 2001. However, Liberty has defeated Virginia Tech just three times in their 14 previous matchups, a pair of back-to-back wins in 1999 and 2000. On Friday, the Flames won their first NCAA game at the D1 level, while the Hokies snapped a 12-year victory drought. Tonight, Tech goes for its first Sweet Sixteen bid in 52 years. No. 9 Oklahoma Sooners (20-13, Big 12 at-large) vs.
Again, a pair of teams in the same state are scheduled for the same rough tip-time window. The Cavaliers and Sooners last met in the consolation bracket of the 2010 Maui Invitational, an easy 74-56 victory for Virginia. The two missed each other in this season’s Battle 4 Atlantis, thanks to Wisconsin‘s win over Oklahoma in the semifinals on Thanksgiving Day. Tonight’s victor will return to the Round of 16 for the first time since 2016. No. 11 Ohio State Buckeyes (20-14, Big Ten at-large) vs. The Buckeyes defeated the Cougars three times in the 1960s, and also claimed the most recent meeting, back in November of 2004 in the semifinals of what then known as the Guardians Classic in Kansas City. Houston is looking to get to the second weekend for the first time since its ill-fated run to the 1984 national title game, while it’s been a mere six-year wait for Ohio State. No. 13 UC Irvine Anteaters (31-5, Big West automatic bid) vs. The Anteaters, aiming for their second-ever NCAA win, and Ducks, hunting for their third Sweet Sixteen in four years, have met regularly of late. Oregon is 6-2 all time against UC Irvine, including wins in 2013, 2014, and 2015. In fact, the Anteaters two wins in the series came way back in 1981 and 1982. Another fun and good mid-major bows out of the Big Dance. It has not been the best opening weekend for teams that this site has covered all season long. With Wofford falling to Kentucky, Florida besting Nevada, and Utah State losing to Washington, we’ve seen a lot of the teams from the top of our Other Top 25 Rankings go down early. Unfortunately, the Buffalo Bulls — winners of 32 games this season — met a similar fate this evening at the hands of the Texas Tech Red Raiders. 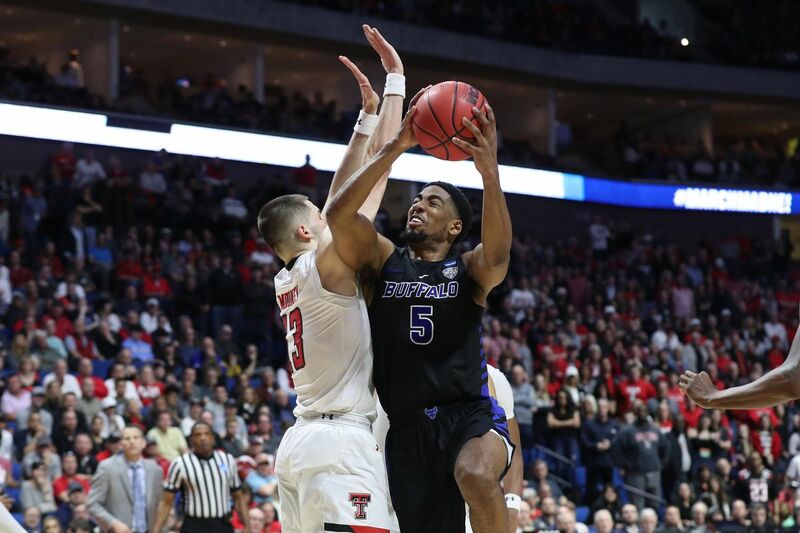 It was ultimately the TTU defense, which is unequivocally the best in the nation, that caused the Bulls’ downfall in a 78-58 Buffalo loss. While the game was competitive in the first half, TTU came out after the break firing on all cylinders. They emerged with a 28-7 run over the first nine minutes of the half, effectively burying the Bulls right then and there. 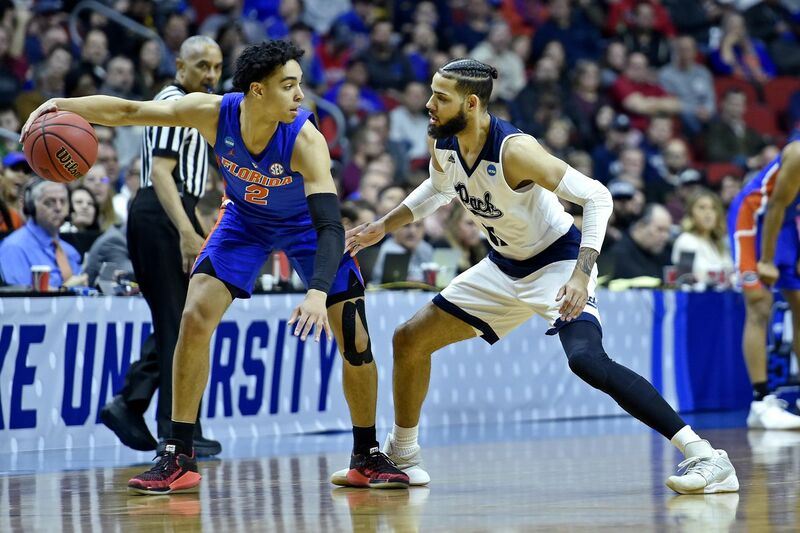 Ultimately, it was a disappointing offensive performance for the Bulls, a team that both boasts a top-20 offense on KenPom and has looked like world-beaters in recent weeks, especially following a dismantling of Arizona State in the first round. Perhaps the saddest part of this loss is that Buffalo, a team full of veterans and senior players, will be drastically different next season. 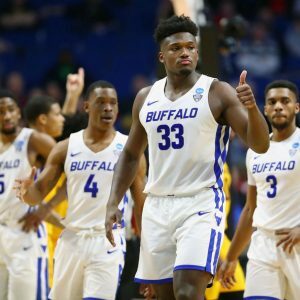 Players such as CJ Massinburg, Nick Perkins, Jeremy Harris, and Dontay Caruthers will have graduated, and questions will certainly be raised about whether or not Power-5 schools will offer Nate Oats a better deal than Buffalo’s most recent five-year, $837,000 per year contract extension. For now, we should celebrate the great season they have had and recognize the wonderful things they accomplished, chief among them being knocking PAC-12 teams out of the NCAA Tournament in two consecutive years. Buffalo-Arizona State and Wisconsin-Oregon highlight Friday’s afternoon action. No. 10 Iowa Hawkeyes (22-11, Big Ten at-large) vs.
Iowa returns to the NCAA Tournament for the first time since making three straight trips between 2014 and 2016. This will also be the Hawkeyes third straight appearance in a 7-vs.-10 game, winning on both previous occasions as the 7. As for Cincinnati, the Bearcats last missed the field in 2010, Mick Cronin’s fourth season. They’ve won their last two first round games, and three of their previous four. No. 9 Oklahoma Sooners (19-13, Big 12 at-large) vs.
Based on the NET, this is the closest matchup in the entire first round, with Ole Miss ranked one spot ahead of Oklahoma (36 vs. 37). The Sooners are making their second straight NCAA appearance, but they last won a tourney game in 2016 — when they reached the Final Four. As for the Rebels, they’re tied with South Carolina for the fewest NCAA bids among current SEC members (nine). Kermit Davis’ first Ole Miss squad will look to follow Andy Kennedy’s final two NCAA squads (2015 and 2016), each of which won a single game. No. 14 Northern Kentucky Norse (26-8, Horizon League automatic bid) vs.
Northern Kentucky is hoping for a bit more success in its second NCAA trip than it experienced in its first, though the Norse only lost to Kentucky by a 79-70 score in 2017’s first round. Texas Tech, meanwhile, is making its second consecutive appearance under third-year coach Chris Beard. Last season, they departed in the Elite Eight, which marked the Red Raiders’ most successful trip of the 16 they’ve made. No. 13 UC Irvine Anteaters (30-5, Big West automatic bid) vs. Note that three Big 12 teams open their tournaments in this window. Kansas State, making its third straight trip and 31st overall, is also coming off a 2018 Elite Eight run. On the other hand, this is only UC Irvine’s second NCAA bid ever at the Division I level. Last time, in 2015, they fell to Louisville by a 57-55 count in another 4-vs.-13 game. No. 15 Colgate Raiders (24-10, Patriot League automatic bid) vs. This will only be Colgate’s third-ever NCAA Tournament game, following a pair of consecutive first round exits in 1995 and 1996 by a Raider team anchored by center Adonal Foyle. As for Tennessee, the Volunteers are making their second straight trip and 22nd overall, though they’ll look to improve upon last season’s second round exit at the hands of eventual Final Four qualifier Loyola Chicago. No. 16 Gardner-Webb Bulldogs (27-5, Big South automatic bid) vs.
Gardner-Webb is making its first Division I tournament appearance (and the Bulldogs only managed to reach the Division II tournament once during their time in that classification). Meanwhile, Virginia, already the first No. 1 seed to lose to a 16, would like to avoid becoming the first No. 1 to lose to a 16 twice, as it opens its 23rd NCAA Tournament. No. 11 Arizona State Sun Devils (23-10, Pac-12 at-large, First Four winner) vs.
Arizona State’s First Four win over St. John’s set up a reunion in Tulsa. Current Sun Devils coach Bobby Hurley took the Bulls to their first D1 tournament in 2015 before departing for the Valley of the Sun. 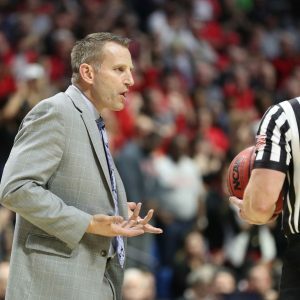 One of his assistants, Nate Oats, then took over and has he’s since taken Buffalo to three NCAAs, with last year’s win over Arizona being the program’s first all-time. As for the Sun Devils, even though this is their second trip in a row, they’re looking for their first win in the main draw since 2009. No. 12 Oregon Ducks (23-12, Pac-12 automatic bid) vs. The Pac-12 has three teams in the field (RIP #Pac1Bid), two of which tip in this window. Both of these teams are back after missing the field in 2018. The 2017 NCAAs were both fairly successful for both, with Oregon reaching the Final Four and Wisconsin falling in the Sweet Sixteen. However, only one will be able to have dreams of matching that success by the time late afternoon rolls around in the Bay Area. This Friday episode of the Eye on College Basketball Podcast opens with Duke’s comeback win on a quality Texas Tech team that showed some ways in how the Blue Devils can, and eventually may, be defeated. From there, the guys get into NC State’s 10-1 start (9:45) after it beat No. 7 Auburn, preview Ohio State-UCLA (20:50) and Kentucky-UNC (24:10) in this Saturday’s big CBS Sports Classic, and wrap with Kansas’ tricky road test at Arizona State (29:50). A fun audio stuffing stocker of sorts for our loyal listeners, as Parrish and Norlander didn’t let the weekend wrap before getting a good episode in to look back at the weekend and reflect on what went down in Chicago. The guys open — briefly! — on deep dish pizza before getting to Kansas’ loss at Arizona State (4:20) and how that opens up a debate over who should be No. 1. Additionally, there’s Kentucky (14:40) and its statement win over UNC … and the issue now nagging at Roy Williams’ heels (24:10). Ohio State (30:45) has Chris Holtmann one win away from the best start of his career, while UCLA has Steve Alford (35:05) and his job status beyond this season very much in doubt. Merry Christmas from us to you, and thank you for being loyal to the podcast. OK, we had a fun but not insane first couple of days of the Big Dance. So will the weekend make up for it? It’s quite possible. Gary Parrish and Matt Norlander go region by region and recap the biggest games, stories and moments for Thursday and Friday. They open with the West, because that’s where Norlander saw Murray State’s Ja Morant in person in Hartford on Thursday. After that, it’s onto reflections and predictions in the East (21:30), the South (34:00) and, to wrap the pod, the Midwest (46:00). Half of this season’s Sweet Sixteen will be set at the end of the night. No. 6 Maryland Terrapins (23-10, Big Ten at-large) vs. The Terps and Tigers have never met in the NCAAs and haven’t played period in 30 years, with LSU having swept a home-and-home series in the 1987-88 and 1988-89 seasons. With a win, Maryland will make it to the Sweet Sixteen for the first time since 2016, while LSU is looking last reached the second weekend in 2006 — coincidentally, also out of Jacksonville. No. 7 Wofford Terriers (30-4, SoCon automatic bid) vs. While Wofford and Kentucky haven’t met in the nearly 70-year window that College Basketball Reference covers, the Wildcats got a game from the Terriers’ SoCon rivals, UNC Greensboro, back on December 1st. Sure, Kentucky won by 17, but the Cats actually trailed with 10 minutes left. Amazingly, this is the third-closest matchup of the Second Round, going by the NET, with a mere seven spots separating Wofford from sixth-ranked Kentucky. Naturally, Wofford is aiming for its first-ever Sweet Sixteen appearance, while Kentucky has considerably more. No. 10 Florida Gators (20-15, SEC at-large) vs.
No. 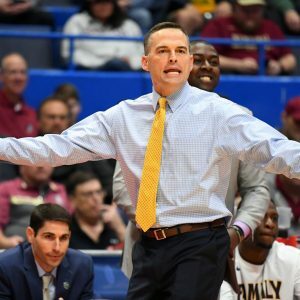 12 Murray State Racers (28-4, OVC automatic bid) vs.
It’s been 20 seasons since Florida State secured an 80-76 overtime win over Murray State in a late December matchup. 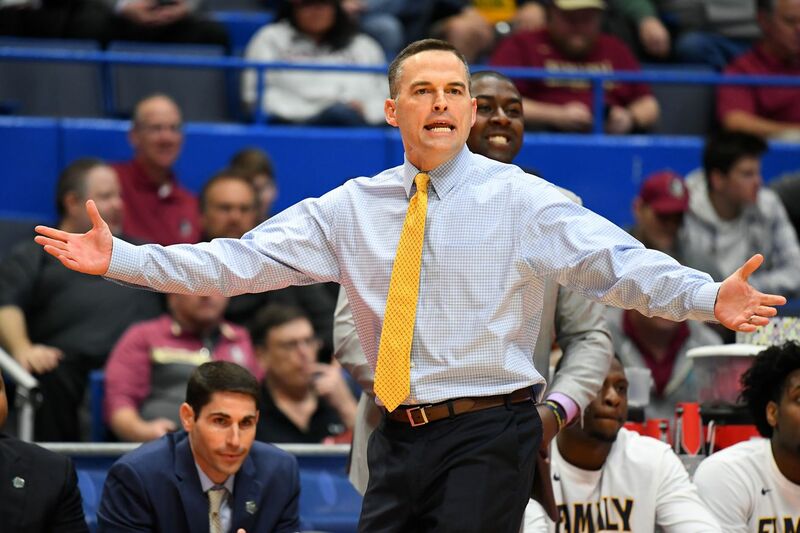 As you’d expect, the Racers have never won two NCAA games in a Division I tournament, while the Seminoles can reach the West regional semifinals for the second straight season with a victory. No. 9 Baylor Bears (20-13, Big 12 at-large) vs.
Gonzaga has won four straight over Baylor, though the last of those victories came in the 2012-13 season. The Bulldogs can reach their fifth consecutive regional semifinal by knocking off the Bears for the fifth time in succession, while the Bears last made it in 2017. No. 10 Minnesota Golden Gophers (22-13, Big Ten at-large) vs.
For the first time since 2011, we have an intraconference matchup in the second round, and the Spartans routed the Golden Gophers by 24 in East Lansing on February 9th. Somewhat surprisingly, Michigan State late reached the second weekend in 2015, but that drought pales in comparison to the one Minnesota owns. It dates back to 1997. No. 6 Villanova Wildcats (26-9, Big East automatic bid) vs. The Wildcats have won their last three meetings over the Boilermakers, though all of those have come in November or December. Back in 2016, Villanova defeated Purdue in a 79-76 classic in the Gavitt Games series in West Lafayette. The defending national champs are looking to break a cycle of “second round exit, followed by national title” that began in 2015, while the Boilermakers can reach their third straight regional semifinal with a victory. No. 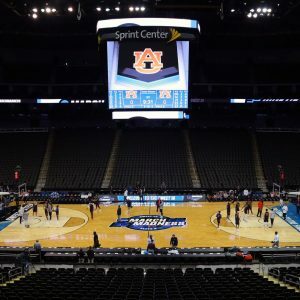 5 Auburn Tigers (27-9, SEC automatic bid) vs. This is the closest second-round matchup by the NET and the only one in which the lower seed is ranked higher. Auburn finished the season 18th, with Kansas ranked 20th. It’s been 34 years since the Tigers and Jayhawks met — period or in an NCAA Tournament game. That year, 11th-seeded Auburn eliminated third-seeded Kansas at this very stage, by a 66-64 score. A similar result, though likely with more points, could be on the cards tonight. Sorry loyal readers and fans of these programs. It’s the risk with the reward! Are you in need of a head coach? Are you in the Southeastern Conference? If the answer to both is “yes” and you’re not Texas A&M, then we’ve got good news: we’re here to help. As both Alabama and Vanderbilt embark on coaching searches, here are several coaches with regional or program ties that should get at least a flitter of consideration. This doesn’t include Nevada’s Eric Musselman and Buffalo’s Nate Oats, who will likely factor into any high major coaching search until they don’t. The Crimson Tide will likely use those oodles of resources to attract a big-name candidate, and Vanderbilt just went down the mid-major path by hiring Bryce Drew. But that shouldn’t preclude the coaches below, who have each had major success over their respective careers. McMahon’s name got the March boost with the Racers’ disemboweling of Marquette, and emergence of lottery-bound point guard Ja Morant. Unearthing Morant is a major feather in his cap, but in his four short years at Murray State he’s also signed and developed other high-level talents in Jonathan Stark and Terrell Miller. The Racers’ top post has a history of producing successful high major coaches with Steve Prohm, Billy Kennedy and Mick Cronin being the three coaches to precede McMahon. The connection to Alabama is more natural, given that Brannen spent six seasons on Anthony Grant’s staff, and took over as interim coach for the 2015 NIT when Grant was let go. Since then, he’s taken a nascent Division I program in NKU and turned it into a Horizon League power. The Norse have made two out of the last three NCAA Tournaments, while going 40-14 in league play over that time. And Crimson Tide fans worried about returning to the Grant’s plodding style of play, have no fear: Brannen’s teams have generally played much faster than those of his former mentor. Five years later, at a schools without that sentimental pull, nothing would seem to have changed. But for Vanderbilt, you’ve got to mull it over at least for second when you’ve got a guy with 805 wins in your own zip code. The calculus may be a bit different for a 46-year old Byrd protege. Alexander played for the Bruins in the mid-90’s, and spent 16 seasons on Byrd’s staff. He then took over yet another Nashville program in 2014 — Lipscomb — and brought it to new heights. 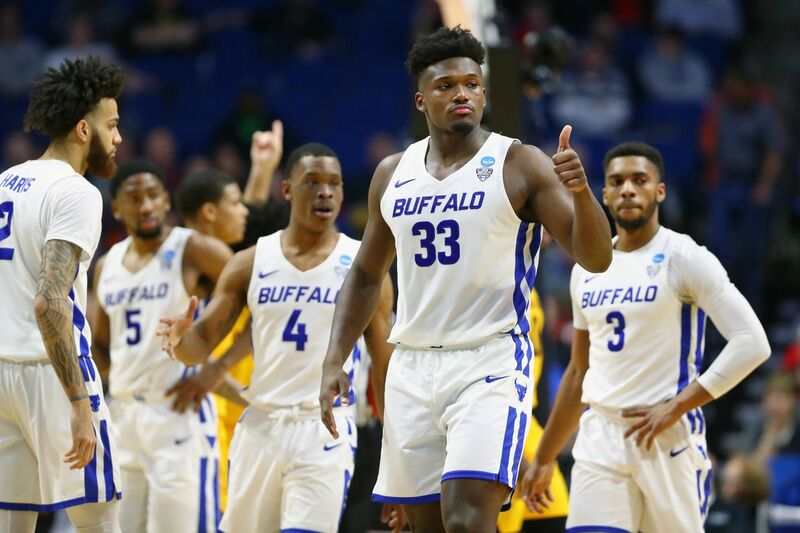 The Bisons made their first NCAA Tournament ever last season, and followed it up with hanging around the at-large conversation this entire season. Alexander’s team posted top-54 marks in both offensive and defensive efficiency this year, and he’s won at least 20 games the past three seasons. After 17 seasons, would Young want to leave Wofford? While that feels similar to the situation with Byrd at Belmont, Young is in fact — gulp — younger at 55, and his name will get the March boost as well. He’s built one of the country’s most efficient offenses, which the nation saw firsthand as the Terriers confidently sliced up Seton Hall last Thursday. With Fletcher Magee and Cameron Jackson out of eligibility, the timing might be right for Young to explore a high major position, if that is what he wants. Miller, who walked on at North Carolina as a player, has overseen a transformation at UNC Greensboro. When he took over in 2012, the Spartans were coming off three seasons of single digit wins. After a few seasons to get going, he’s created a defensive juggernaut tthat has competed at the top of a resurgent SoCon. UNCG got the league’s auto-bid with a 27-8 season a year ago, and followed it up by being the first team out of this year’s NCAA Tournament with a 28-6 record. Forbes has been at the center of the SoCon uptick as well, winning at least 24 games in each of his four seasons at ETSU. 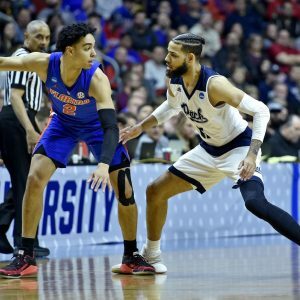 The Buccaneers made the 2017 NCAA Tournament, and have contended ever since with a disruptive, turnover machine of a defense. The former Gregg Marshall assistant’s name has percolated in high major coaching searches over the past few years, and that figures to stay the same in 2019 as he has kept winning. 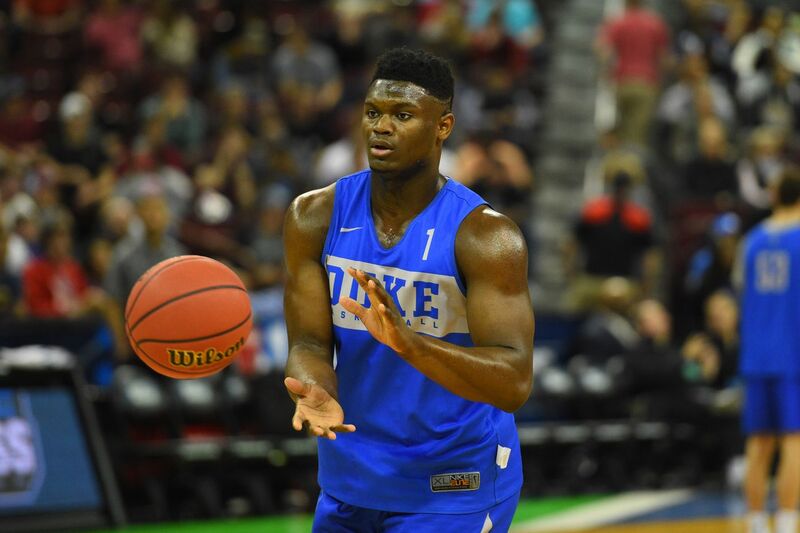 Zion Williamson begins what is likely to be his lone NCAA Tournament run this evening, a night that’s particularly ACC heavy. No. 9 Washington Huskies (26-8, Pac-12 at-large) vs. The Pac-12’s regular-season champ meets the Mountain West’s co-champ (and tournament winner) in the heart of the Midwest. This will be Utah State’s 21st all-time NCAA appearance, pushing them just ahead of UNLV among current Mountain West members. But this is the Aggies’ first trip since 2011 and they last won a tourney game in 2001 (over Ohio State, host of this pod, oddly enough). Still, USU is back in Craig Smith’s first season, that’s a year better than Washington, which also earned its first bid since 2011, in Mike Hopkins’ second season in charge. Note that the Huskies have won an NCAA game in each of their prior five appearances. No. 16 North Dakota State Bison (19-15, Summit League automatic bid, First Four winner) vs.
Duke, the tournament’s No. 1 overall seed, is in the field for the 24th straight time. And the Blue Devils will have to feel confident of opening with a win for the fifth straight tournament. As for North Dakota State, Wednesday’s win over NC Central was their second triumph in the Division I tournament in four appearances, though it can’t quite match 2014’s 12-over-5 upset victory over Oklahoma. No. 14 Georgia State Panthers (24-9, Sun Belt automatic bid) vs.
For the second season in a row, Georgia State meets the American’s regular-season champion in the first round, as the Panthers lost to Cincinnati 68-53 in a 2/15 game. However, Ron Hunter’s Panthers do have a win as a 14, having stunned Baylor Bears in 2015. This will be GSU’s fifth Division I tournament trip. Houston, on the other hand, has appeared on 20 previous occasions, though they’ve only made three trips since 1992. In fact, last season’s first round win over San Diego State marked the Cougars’ first NCAA victory since 1984’s national semifinal. No. 12 Liberty Flames (28-6, ASUN automatic bid) vs. This will be Liberty’s fourth NCAA trip all-time, but its first as an Atlantic Sun member (in its first season as a member). The Flames are 0-3 in their previous three trips, the last of which came as Big South champ in 2013. Mississippi State has made 10 previous appearances, the last coming 10 years ago. The Bulldogs last won an NCAA game in 2008, however. No. 16 Iona Gaels (17-15, MAAC automatic bid) vs.
Iona, appearing in its 14th NCAA Tournament, leads the Metro Atlantic by some margin in that department. But the Gaels’ history pales in comparison to UNC’s, as this will be the Tar Heels’ 50th bow on the NCAA stage. Iona, in its fourth straight tournament and sixth of the decade, is looking for its first tournament win since 1980. As for the Heels, their last first round exit came all the way back in 1999. No. 9 UCF Knights (23-8, American at-large) vs. Even though VCU missed last season’s NCAAs, this will be the Rams’ eighth NCAA Tournament appearance in this decade alone. However, they last won a game in 2016. On the flip side, UCF has only made four previous Division I tournament appearances, the last coming back-to-back in 2004 and 2005. However, the Knights are looking for their first-ever tournament win. No. 11 Ohio State Buckeyes (19-14, Big Ten at-large) vs. Both Ohio State and Iowa State have been relatively successful in the NCAAs in recent history. The Buckeyes have only lost in the first round in three of their 13 prior appearances since the calendar rolled over to 2000 (with 2014’s one-point loss to Dayton being the last occasion), while the Cyclones have failed to make it out of round one just twice in their nine prior trips in that span. While this will be Ohio State’s second straight trip under Chris Holtmann after a pair of misses in Thad Matta’s final two seasons, last season’s Iowa State miss ended a six-year streak for the Cyclones. No. 13 Saint Louis Billikens (23-12, Atlantic 10 automatic bid) vs.
Saint Louis is back in the NCAAs after a five-year absence, as the Billikens made it to the round of 32 (and no further) in three straight tournaments between 2012 and 2014. As for Virginia Tech, the Hokies are now on a three-year NCAA streak, though they’ve fallen at the first hurdle in each of the last two seasons. The Hokies last won a tournament game in 2007, under Seth Greenberg. The Midwest is a good region in which to pick an upset: Stay away from the weakest 1 seed, and the weakest 1 seed statistically is Kansas. Oregon would be an acceptable 3 seed if they were healthy, but they have lost crucial defensive big man Chris Boucher. The 6 seed Creighton is also missing a key player in Mo Watson. At the same time, Oklahoma State is a ridiculously strong 10 seed, and Michigan State is a 9 seed with some elite top end talent and which has survived a gauntlet of a schedule. You are not going to win a large bracket pool by picking 1 and 2 seeds to the Final Four, so if you want to go with an upset Final Four team I’d do it in the Midwest. Stay away from Creighton: It has been impressive the way that Creighton has held the ship together without Mo Watson, but the fact is that they haven’t been quite as good as they were with him. Their computer ratings have been slowly fading over the last two months, when they’ve been just 8-9 overall. Their saving grace has been outside shooting, as they’ve hit 40% behind the arc for the season, but Rhode Island led the Atlantic Ten in defensive 3PA/FGA ratio. Purdue is a really tough match-up for Iowa State: Purdue has a ton of size, and I’m not entirely sure how Iowa State is going to deal with that. Freshman Solomon Young is 6’8″ and has come on and played a lot of minutes over the last month, but he’s no match for Caleb Swanigan or Isaac Haas. Iowa State’s only hope is hitting a ton of outside shots, but Purdue is one of the better three-point defensive teams in the nation. Oklahoma State is a crazy dangerous 10 seed: The Cowboys are 24th in Pomeroy, and have been playing their best basketball over the past couple of months due to the emergence of Jawun Evans as perhaps the best point guard in the nation. Their defense is bad, but their path ahead is not particularly difficult as far as 10 seed draws go, particularly with Oregon losing Chris Boucher. 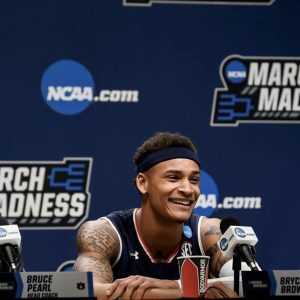 If you want a more conventional Final Four team, take Louisville: If you’re in a bracket competition with hundreds of contenders or more, then you need to pick some goofy Final Four teams. If you’re in a bracket competition with just a few friends then you might want to avoid an Elite 8 with a 4 and 10 seed in it. So if you want a more conventional Final Four team out of the Midwest, I would recommend taking Louisville. They have to survive that difficult Oklahoma State game, but after that they have a soft and short-handed 3 seed as their toughest possible Sweet 16 opponent, and are in the region with the weakest 1 seed. Louisville is much more balanced than some of Rick Pitino’s other recent teams have been, and they were 4th in the ACC in offensive efficiency despite lacking a go-to playmaker like Russ Smith or Peyton Siva. Louisville is the highest Pomeroy-rated team in the Midwest, so you can’t go too wrong by taking them.